Well that took us all a bit by surprise didn’t it? The Fairer Paid Parental Leave Bill is back and it might have more luck getting through the parliament than the last time the Government tried to push it through in 2015. Since then we have had an election and movement of numbers in both houses of parliament. Personally I don’t think that the Government would try to reintroduce the Bill if it didn’t think it could get it through this time. I’ve read the Bill (I know who does that???) and this is my summary of the important things that you should know if it goes through in its current state. It may still change. The Bill refers to your employer provided paid leave as ‘primary carer pay’ and I will do the same in this explanation. Paid Parental Leave (PPL) is the 18 weeks of minimum wage provided by the government. Well that depends. Although the talk in the media last week was that it will come into effect on 1 January 2017, the reality is that the scheme will start at the beginning of the following quarter after the Bill is signed off by the Governor General. So, if that happens before 31 December 2016, the scheme will start 1 January 2017. If it doesn’t get done until, say, next September, then it will take another year to start from now, etc. etc. This is completely useless for those who are trying to plan their finances for the next year. From the date of introduction of the Bill, there are 12 sitting days of parliament before the end of 2016. Then they don’t come back until February. Can the government get the support of both Houses of Parliament to pass the Bill in 12 sitting days and get it signed by the Governor General? Perhaps? Your 18 weeks of PPL will be reduced by the number of weeks of primary carer pay you receive from your employer. If your employer pays you 8 weeks of primary carer pay, you will receive 10 weeks of PPL at the minimum wage. If your weekly amount of primary carer pay is less than the minimum wage, you will receive a top up to reach the minimum wage. The top up will be paid in one lump sum. You will no longer be able to receive your PPL and primary carer pay at the same time. Currently, if you want the start date of your PPL to be the same as the date of birth of your child, you need to have completed your application by submitting a claim and proof of birth within 28 days of the date of birth. Therefore it is backdated by up to 28 days to the date of birth. If you complete your application after your child is 28 days old, the start date of your PPL cannot be backdated to before your application. This is fine if you don’t intend to work for the next 18 weeks after you start to receive PPL as once you return to work your PPL has to stop. However, some parents complete their application much later than 28 days and then find themselves having their payments stopped when they either return to work while receiving PPL or they reach the maximum date for which you can receive PPL. They actually take the time away from work to care for their child but don’t get paid their full PPL entitlement because their application wasn’t completed early enough. Going forward you will be able to backdate your application by 28 days, regardless of when you complete it within the year after birth. To be eligible for PPL you need to meet the work test which is to work 330 hours in a 10 month period of the 13 months before birth. Within that period you can have a break between days of work of up to 8 weeks. That period will now be extended to 12 weeks which will help those who don’t have consistent employment to still meet the work test. Some pregnant women have to give up work early in their pregnancy as their job is considered to be unsafe and no other suitable job can be found for them. Their work test date of 330 hours in a 10 month period of the 13 months before birth is therefore generally not met and they don’t receive PPL. Going forward, your work test will become 330 hours in a 10 month period of the 13 months before the date you had to cease work. When PPL is transferred to the father or partner, they still cannot receive more the 18 weeks in total for Dad and Partner Pay, Primary Carer Pay (the fathers/partners entitlement) and PPL. Now everyone will be paid from Centrelink unless you and your employer agree for you to be paid by your employer. Small businesses must be so happy for this to happen! I can’t find any mention of how much tax will be taken out by Centrelink or whether it will just continue to be 15%. The positives are that more parents will become eligible for PPL from the changes to hazardous work arrangements and break between work days. Administration will move away from employers which will help small businesses save time. What does annoy me is that by giving us no real fixed date in the future no one can really plan ahead. Parents can’t plan how much time they can afford to take off work. This then affects their employers’ ability to plan for their return to work and any employee in a position of maternity cover also doesn’t know how long they will be in their job. I hope this information is useful for you. If you know of someone who may benefit then please share it with them and tell them to sign up to my email list. I’ll keep updating as things progress so they can keep up to date as well. If you enjoyed the information I have provided and need more help, then the My Family Budget eBook is what you need to help you apply for Parental Leave Pay and Childcare Benefit. I explain everything so that everyone can understand how it works and then step you through the application process. It’s such a complicated process, but I can help with that. 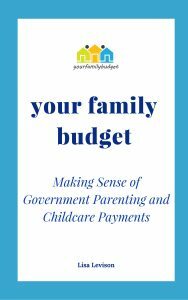 Your Family Budget eBook – Making Sense of Government Parenting and Childcare Payments. My guide to everything you will ever need to apply for and understand Parental Leave Pay, Dad and Partner Pay, Childcare Benefit & Childcare Rebate. All in one place, with easy explanations. Double Dipping – so where are we now? Before I get started, I just want to say one thing. I hate the term double dipping! I feel like I don’t have a choice but to use it. It’s the only thing that people understand when I mention a reduction in Paid Parental Leave for new mothers – oh, you mean double dipping? I was very lucky to receive 18 weeks of Paid Parental Leave from the government as well as 13 weeks pay from my employer. It meant that I had some form of income for over half the year that I took leave from work. I’m not complaining. Should I have felt lucky or should I have expected more from society in general? How about I just stick to the facts? In May 2015 it was announced that government paid parental leave (currently $672.80 per week for 18 weeks = $12,110.40 before tax) would not be available to mothers ONLY IF if they were also receiving paid maternity leave from their employers. After a bit of tweaking, the final proposal was that if the number of weeks of pay from from your employer is more than the 18 weeks of government paid parental leave, then you would receive nothing from the government. If you received less than the government amount then you would be topped up. No one would receive less than the 18 weeks pay. In my case, I would have received the 13 week pay from my employer, then 5 weeks of paid parental leave to reach the total of 18 weeks. The reason for this change was to save the government $1 billion over four years which would then be redirected into changes to the funding of Childcare. It was meant to start on 1 July 2016, but as that date approached, the legislation had still not passed the Senate. Many families were unable to plan ahead as they didn’t know what income they would be entitled to once their babies were born. By April 2016, the government had decided that the Senate would not be able to pass the legislation required for the changes, the election was called not long after and it was kind of forgotten about. But not really forgotten completely. This brings us to last week. Social Services Minister Christian Porter made a speech that reaffirmed his intention to introduce new legislation that will stop mothers from accessing parental leave pay if it is already provided by their employer. We will just have to wait and see what happens next. I’ll keep you informed. Centrelink App to be removed soon – make sure you have the latest one. Do you use Centrelink’s phone Apps? Centrelink have announced recently that the Families App will be retired on 26 September. If this is the only App you currently use then I would encourage you to now download the Centrelink App. If you log into the old App you will actually be prompted to download the new Centrelink App. Also, I found it easily in the App Store on my iphone by searching for ‘Centrelink.’ It is also on Google Play, but not the Microsoft Windows Store. Your PIN will remain the same in the new App, but if you have been using the Vault feature to store documents, these will disappear unless you email or print them. What do I use the most on the Centrelink App? If you tap on ‘Personal’ it will bring up your basic information such as Date of Birth, YOUR CRN and also your CAN. It also tells you what payments you are approved for. An approval for ‘CCB for Approved Care’ means you are also receiving the CCR. If you tap on ‘My Family’ it will list your children that have been included in a Centrelink registration and it will include their Date of Birth and CRN. If you tap on ‘Menu’ and ‘Childcare’ you will see everything that is relevant to your CCB/CCR with each child. A summary of how much CCB and CCR they have received in the current financial year, your CCB percentage and a weekly summary of your child’s attendance at childcare with the fees for that week. Today is a massive day for me! I am finally releasing for sale my Your Family Budget ebook. I want to tell you a bit about the story of why I created Your Family Budget, and the ebook with the same name. We had friends over one night who were expecting their first child a few weeks later and they were telling us their whole Centrelink story. The application for Parental Leave Pay, going into Centrelink, logging in online… going back into to Centrelink. You get the picture. I kept making suggestions here and there so after they left, my husband turned to me and said ‘you know this stuff, why aren’t you teaching it to everyone?’ I told him I would go and get a degree in Centrelink and think about it. But I did think about it and I started looking at all the information online – and there is so much information online! But it was all basic information, and the devil is definitely in the detail when it comes to this stuff. I started reading the legislation and also the explanations that are found deep deep in the Department of Social Services website. It’s all there, but no one has ever put it together into one package and said ‘here it is, everything you need to know and how to do it in a way that is easy to understand.’ At the moment you have to keep looking for everything on lots of website pages. So this is exactly what I have done. I’ve read, written and used the experience of going through it myself with my kids. Now I want to explain it to everyone who needs to know how to understand and specifically apply for Parental Leave Pay, Dad and Partner Pay, Childcare Benefit and Childcare Rebate. I’ve put a huge amount of time and effort into creating this ebook and I genuinely feel that it will help you navigate through the process in a way that makes it easier for you. But this website isn’t just about the ebook. With my website and Facebook page, there are always new things that you need to know and I plan to keep sharing information with you. So thank you for reading this and I hope I can help make things easier for you in your parenting journey. This post has been updated to include the latest rates and information as at 1 May 2018. This week saw the first sitting of parliament since the federal election. The Government didn’t waste any time and reintroduced* the legislation that will make the big changes to Child Care Benefit and Child Care Rebate – the Jobs for Families Child Care Package. Originally, this package was meant to start on 1 July 2017, but in the Budget delivered in May 2016, its introduction was delayed by one year and will begin on 2 July 2018. What are the Changes to Child Care and how will it affect you? 1. The Childcare Benefit and Childcare Rebate will disappear and be replaced with one Childcare Subsidy. 4. For families earning more than $186,958, an annual subsidy cap of $10,190 per child will apply, similar to the cap of $7,613 we have now. 5. All of these rates will be adjusted for CPI so when 1 July rolls around each year they will be slightly higher. It looks like the Hours of Activity will relate to the parent with the lower number of hours. So if your family has a stay at home parent that works less than 8 hours, your family wont be able to access the new Childcare Subsidy.The exception is if your Combined Family Income is less than $66,958. Then you will be able to access 24 hours a fortnight. Edit: The Bill was passed by the parliament on 9 February 2017. I have made minor updates to this blog post to reflect this and any other rate changes. p.s. If you want detailed information on the items listed above, then download the Childcare Subsidy Solution and work out ways that you can increase and decrease your Subsidy based on the amount that you earn and work.